Epics like Ramayana and Mahabharata are replete with geographical, historical, biological and social material. Ramayana though essentially poetry, reflects time and environment, knowledge and nations of its poet Valmiki. The prevalent notion deep-rooted amongst people about the. geographical scenario of Ramayana is entire India and an adjoining island Ceylon (Sri Lanka), which is generally presumed to be Ravana’ s Lanka. This notion was unacceptable to a few devoted researchers who looked for and found evidences drawn from the text of the epic itself or otherwise for Ramavana sites. They put forward a theory that the geographical location of all the events described in Ramayana must have been to the north of Mount Vindhya and river Narmada. This book tries to go deeper in this direction An attempt is made here to determine the location of various important. places mentioned by Valmiki, like Mt. Chitrakut, Dandakaranya, Pancavati, Kiskindha and finally Lanka. Where were these places in north India? Locations proposed by earlier researchers are' discuss in the light of new data gathered and presented here. Literary and geographical justification is provided for the alternate sites proposed, The identifications and locations of these sites are interpreted in a manner not dissonant with modern knowledge and also with Valmiki's geographical scenario. Topographical and satellite image studies (using Google Earth) have helped in understanding the physical features of these sites and locating them in the present map of India. Some entirely new evidences are provided and new connections, hitherto unnoticed by earlier researchers. Tare presented' in The Search for Ravana's Lanka. Born in Pune in 1944 Sukanya chose Microbiology as her field and obtained M.Se. and Ph.D. from the University of Mumbai. However, she left the field of scientific research and plunged into social activities from 1978 onwards, joined People's Science Movement and worked as socio-cultural activist till 1992. She, at the same time, ventured into fiction as well as non- fiction writing, which was published in various Marathi periodicals and magazines. These articles were of literary criticism or covered various relevant socio-cultural issues. She started writing short stories and poems for children. The subjects and their treatment both were quite unconventional. Her collection of poems 'Napasanchi shala' ('A school of failures') and a biography 'Dr Kotnis' were well received. Both fetched her Maharashtra State Awards. Two of her short story collections drew the attention of connoisseur readers and she received awards for these including a Maharashtra State Award. Her translation from Hindi of the biography of renowned Hindi writer late Shri Hajariprasad Dwivedi was published by the 'Sahitya Academy', Delhi. Having keen interest in Indian Mythology, Sukanya has written stories and plays based on myths, which were published in various magazines. A collection of her articles 'Magova Mithakancha' will soon be published. For more than a decade, she did independent research on 'The Search For Ravana’s Lanka' and was guided later by Dr Romila Thapar. The present book is the outcome of this research. She lives in Mumbai since 1970. Ramayana has a unique place in the cultural traditions of India. Together with the great epic Mahabharata it has played a major role in the formation of the Indian culture. It has permeated so deeply in the Indian psyche that for centuries and even today, in the days of T.V. serials and cinema, it has provided millions of ordinary people with entertainment, comfort, and succour. The epic form of Ramayana gives it the capacity to assimilate varied cultural experiences in the shape of folk tales, bard's songs, legends, and myths. Ramayana is at once a literary work in the form of an epic poem, an important religious text of the Hindus, a very influential mythology and embedded in all this are certain historical facts. Ramayana has been studied by enumerable scholars, literary critics and poets, theologians and historians. The focus of the present study is the geography of Ramayana. An attempt is made here to determine the location of various places mentioned in Ramayana like Mt. Citrakuta, Pancavati, Dandakaranya, Kiskindha, and finally Lanka. The difficulties faced by any scientific attempt to winnow the historical facts from the heap of mythological chaff are well known. D.D.Kosambi1 has commented on this difficulty of discriminating historical truth from myths and legends. This is also true about geographical information and place names. One would think that at least the location of such physical entities like great cities and mountains will not become wrapped in mystery and become controversial. But this is not so. Over two thousand years, the location of Lanka, the capital city of Ravana, has 'travelled' thousands of kilometres southwards. If we add two more factors, the task of the researcher becomes still more complicated. Firstly, there exist innumerable versions of Ramayana created by various communities or religious sects, not only in the Indian sub-continent but also in other countries. Secondly, the original Valmiki Ramayana has grown and changed over centuries by later extrapolations and modifications, to such an extent that, confusing and contradictory references to rivers, mountains and cities occur in Ramayana. Last but not the least, as is well known, the researcher has to rely almost totally on literary sources and living traditions in the absence of enough archaeological data. In view of these difficulties, what method and approach can one adopt fruitfully? The Vedas, the epics, Puranas, Bhagavadgita, Sruti, Smrti, the works of Panini, Patanjali, Bhasa, Kalidasa, Varahamihira and Bhaskaracarya, all these and many more works form parts of our much valued ancient literature. In the last 100-150 years pundits and scholars have realised that quite a sizable amount of knowledge of historical, geographical, astronomical, biological and sociological nature is embedded in our ancient literature which is of religious, legendary or mythological nature. For carrying out geographical study of ancient India, this ancient literature, although itself of non-geographical nature, is the first source of information. References exist of kings, dynasties, descriptions of tribes and janapadas, names of places and of birds and animals together with plant-life of a region and descriptions of events or seasons. All such material, although incidental, if studied, analysed and interpreted properly can throw new light on ancient geography, history, or culture of a region. Besides ancient literature, inscriptions on stones, bricks or copper-plates, coins and seals, travel accounts of travellers of Indian or foreign origin, accounts of historians, geographers, pilgrims and rulers, all can give valuable information. In modern times, geological and archaeological methods like carbon-14 method for dating, mathematical and astronomical calculations are unanimously accepted scientific methods used by researchers and the results are put to scrutiny. Such study advances the geographical knowledge derived from literary sources. Epics like Ramayana or Mohabharata are works of literature created by poets like Valmiki and Vyasa who lived in a particular period of history in a certain social, cultural and natural environment. Whether the epics are imaginary poetry, a flight of poet's imagination or history, is not the question here. Valmiki belonged to a certain period and environment, which will naturally be reflected in his poetry, providing it with 'historical context but not necessarily with historicity' as Romila Thapar' has said. The word Ramayana literally means the journey of Rama. The real story of Ramayana starts from Ayodhya. Some of the places are even today at the same geographical locations as described by Valmiki in Ramayana. The places from Ayodhya to Mt. Cltrakuta are still identifiable, e.g. Ayodhya, Srngaverapura and some rivers and mountains. Many other places are either wiped out in the course of history or their original names are twisted and distorted so much that they have become unrecognisable. For identifying ancient sites only their names and the tales and legends associated with them can be misleading. Other natural factors untouched by human hands like the rivers, mountains and the topography along with climatic patterns and natural flora and fauna should be applied to ancient sites for their acceptable identification. The most serious obstacle in the way of utilising the epic and puranic texts is the corruptions, interpolations, and intentional additions to and omissions of text from the 'original'. Even then, the numerous isolated stray references collectively will continue to provide a considerable addition to our geographical knowledge of ancient India. Many a times material objects decay or get destroyed but things like customs and traditions of festivals, jatras, religious and non-religious fares and gatherings that are traditionally practiced survive. From systematic and probing studies of such living traditions some deductions can be made and inferences can be drawn which help us reach the roots. Then to confirm such inferences other methods can be employed. Being an epic poem Ramayana and also Mahabharata, present us with a complex of characters, human relationships, riddles of a psychological nature and moral puzzles. It unfolds before us a poet's world and we can appreciate and criticise the aesthetic aspects of this work of literature. However, the present study concentrates on geography and all such questions are out of the scope of this work. For example, stories like Rama's killing of Sambuka or Valin and banishing Sita unjustly, pose many questions of moral, social, and religious nature to the modern mind. But I have only dealt with 'where', rather than with 'how' and 'why'. Ramayana literally means the journey of Rama, after being banished from Ayodhya for fourteen years of vonavasa. Rama with Laksmana and Sita travelled up to Srngaverapura where they crossed river Ganga and then crossed the confluence of rivers Ganga and Yamuna. They went to Mt. Citrakuta and visited many hermitages and spent ten years in that area. Then sage Agastya sent them to Panacavati from where Sita was abducted by Ravana. Rama and Laksmana went to meet Sugriva at Kiskindha and with the assistance of Hanumat and Sugriva's viinaro army crossed the waters to reach Lanka. When Ravana was killed and the war was over, triumphant Rama returned to Ayodhya. This entire journey constitutes Ramayana. Many geographical riddles are posed by Valmiki's account of this journey. Most scholars more or less agree that we can take as established fact that, the location of Ayodhya in Ramayana is the same as present day Ayodhya. But what about other places mentioned in the course of the journey? The toughest riddle of all is the location of Ravana's Lanka. Along with people at large, most scholars, including F.E. Pargiter, D.R. Bhandarkar etc. 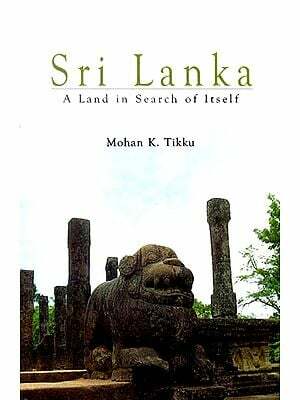 believed that Lanka in Valmiki Riimiiyaaa was the present day Sri Lanka (Ceylon) and this was not questioned for a long time. However, doubts started arising. 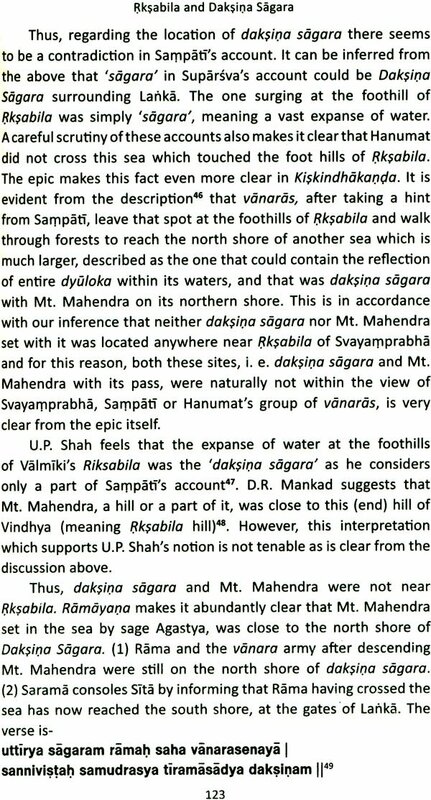 The first scholar to question this assumption and to assert that Lanka was situated in Madhya Pradesh, most probably on Mt. Amarkantak, was Sardar Madhavrao Kibe, who published a paper in Indian Historical Quarterly in 1928. Since then many scholars like T. Paramasiva Iyer, Herman Jacobi, J.C Ghosh, H.D. Sankalia, U.P. Shah, and many others have reached similar conclusions. A short account of the works of these scholars and the nature of the controversy is given in chapter 1 of this book. The thought of writing this book came to my mind a few years back, the reason being my going through the pages of the play 'Sita Josyam' and particularly the prologue to it, written by its author Narla Venkateshvar Rao in 1990. The content of the book thrilled me. The second book that I read in this connection was 'Ramayana and Lanka' written in 1940 by T. Paramasiva Iyer. These two books inspired me to study further. After going through the studies carried out on similar lines by other scholars, the scope of this subject came within view. It was also realised, that amidst the scholars there are contradicting view-points. Gradually I came to the view that Lanka was not situated in Sri Lanka (Ceylon). It was obviously not possible to accept the sites of Australia, Egypt, Malaysia, Sumatra etc., suggested by some other 'scholars'. It was reasonable to accept the thesis that Lanka was in Madhya Pradesh in India. But the exact site still eluded scholars, who suggested various locations. For the last ten years or so I have struggled with this problem. Apart from study of literature I also studied topographical maps and other geographical features of the probable areas of M.P. In addition I have studied the satellite images of the target areas of interest on 'Google Earth', which is now possible. I believe that I have discovered some 'new' evidences, made some new connections, hitherto overlooked by scholars and an attempt is made to determine the location of Ravana's Lanka with some degree of confidence possible under the present circumstances. I have also visited some of the proposed target sites. I humbly present the results of my studies as a tentative thesis for consideration of scholars and all those interested in the subject. For my studies I have used the critical edition of 'Valmiki Ramayana' of Baroda, as the main source of evidences which forms the basis of my arguments presented in this book and other references that are presented are only supportive to the main logic.